A conference of lexicographers: bromides in tweed. But the leading expert in the field is found dead by her own hand – and by her hologlyphic assistant. Is he responsible? Does the death fit any conventional definitions? Can the Doctor realise who wrote the suicide note and why, exactly, it was riddled with spelling errors? The beauty of audio plays lies in the freedom it provides. For nearly its entire run on television, both old and new, Doctor Who biggest villain hasn’t been the Daleks, or the Master, or the Sontarans. It’s been the BBC Budget Office. In the grand scheme of things, the show beloved by millions around the world that was a staple for the childhood of many a Briton existed to make money for the BBC. And the best way to make money is to not spend it in the first place. The jokes about “aliens in rubber suits” and “yet another quarry in Wales” are based in fact. 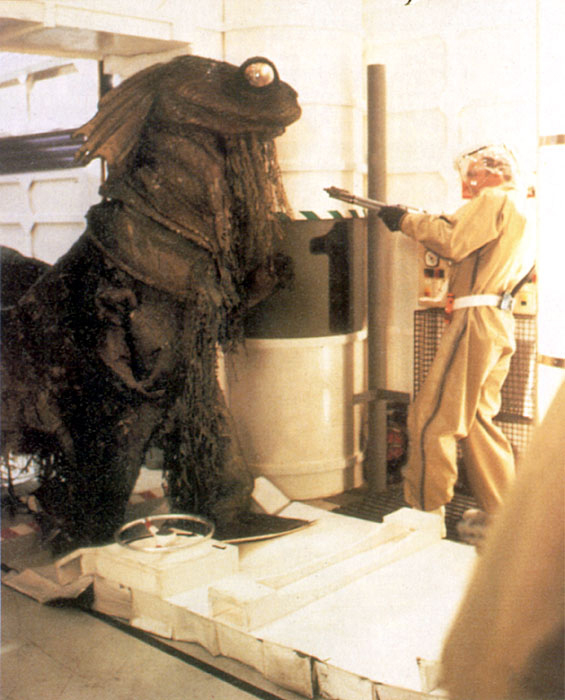 The producers and writers did their best to work within the budgetary constraints provide by the suits in the Broadcasting House, but still, the show has suffered with poor CGI (The Lazarus Experiment), horrible costumes (The Web Planet), and of course, the horrible monster to end all horrible monsters…the Myrka. With Big Finish, this concern is still present. Gary Russell, who was the production head for the Who audio line from 1998 until 2006, stated that each audio play has a budget of about $30,000 (in 2013 American dollars) to cover paying the actors and production staff, pressing the CD’s and converting the recording to mp3 format, and creating the artwork and advertising. The total net profit from Big Finish’s sales wouldn’t cover the budget for one Matt Smith episode, according to Russell. But the audio format allows the writers and actors a chance to stretch their creative boundaries. It allows a writer to let the Doctor and Charley leap from Roman England to the time of the Saxons to the Victorian Era and then into the Time Vortex, all without worrying about special effects and costumes. It allows the actors a chance to portray their characters in ways that a money-conscious producer wouldn’t care for because it might affect ratings. It lets the director and sound department cut loose and focus on sounding good, not looking good. More importantly…most importantly, really…it allows for creative freedom. It allows the writers and producers to come up with adventures that could never work on television, either due to budgetary restraints or the lack of practical effects. Truly, the audio world allows the writers a chance to place their stories anywhere in time and space…or create an adversary that would falter horribly if portrayed on the screen, but works incredibly well in a purely audio medium. 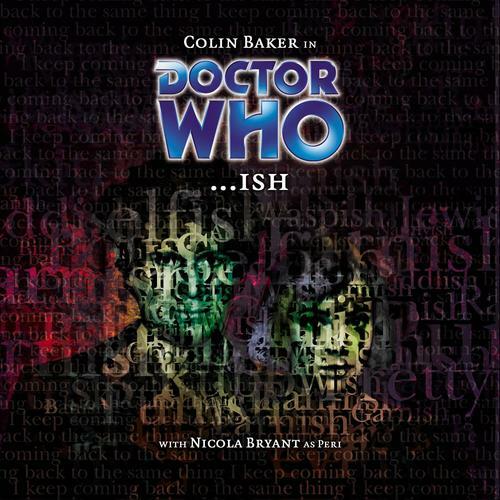 …ish is a unique story that could not have been done on television, as the Doctor and Peri find themselves tongue-tied against a sentient word. 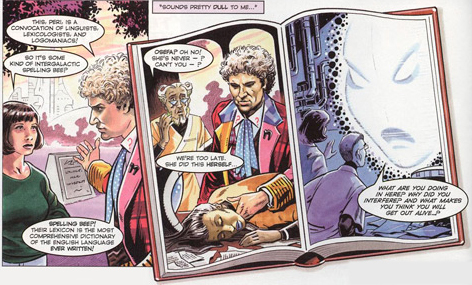 A splendid little story that allows Colin Baker and Nicola Bryant to have a lot of fun playing off each other, …ish’s main fault is its complexity and failure to adequately to explain its ideas in a way the listener can easily grasp, as well as not quite conveying the urgency of the Doctor’s actions and the consequences of a failure on his part. The Lexicon is the university’s crowning achievement, and the campus is packed with professors, linguists, and grammar enthusiasts. Once completed, the grand dictionary will contain the definition, meaning, and usage of every single word in the known cosmos. The Doctor’s old friend, Professor Osefa, and her holographic assistant Book, are making the finish touches and revision to the Lexicon. As the Doctor waxes profound upon the English language, Peri takes the time to slip away for some much needed refreshment. Soon, she meets Warren, an enthusiastic logophile. As the pair bond over their love of wordplay, the Doctor and the head of the conference, Cawdrey, find Professor Osefa locked inside her office, dead by her own hand. But it couldn’t be suicide, the Doctor surmises; the note she left behind was riddled with spelling and grammatical errors. …ish is Phil Pascoe’s sole script for Big Finish. Credit is due to him for taking an incredibly dense and verbose script and giving it over to a handful of actors. This is one of the smallest casts that Big Finish has assembled for an audio play, and Pascoe succeeds in giving each of them their own voice. There’s little confusion as to who is who, there’s no redundant characters or moments, and the conversations and dialogue flow naturally, moving the story along at a brisk pace. There’s alliteration, there are puns and double meanings, there is snappy banter…lovers of language will get a major kick out of this serial. Pascoe hands Colin Baker the English language, and Baker runs with it. This is a script I couldn’t imagine any other Doctor pulling off. Where some actors might have paused for a moment or two as they read a script rich with wordplay and tongue twisting dialogue, Baker dives in with gusto. His performance in …ish is as close to “over-the-top” as an actor can get without hitting the precipice as he speaks with confidence and lets the poetic language flow freely, and as such it comes naturally, with the large, flowery words not becoming a cumbersome burden on the listener. Could you see Davison, McCoy, or McGann saying a phrase like ‘insouciant maledictaballoon’ and getting away with it? Baker does, and manages to do so in half the time and almost without half the syllables! Heck, he manages to make a Delphon joke on audio and gets away with it. Delphon being a language where communication is done solely by movement of the eyebrows, made famous by the Third Doctor in Spearhead from Space. Peri’s “American” accent was always mocked during her television run. Here, in her second performance alongside Colin Baker (the majority of her Big Finish run so far being with Peter Davison), Nicola Bryant holds her own, and the accent has gotten…slightly better, in that while still noticeable, it’s no longer a distraction. Peri’s own “Americanisms” are poked at and made fun of by the Doctor as he waxes about “the letter ‘u’ in colour” and how Webster almost ruined the English language…and her response is to leave him in the middle of a boisterous monologue in order to go get a drink. Six and Peri’s have a very prickly, almost antagonistic relationship in …ish, but it’s comes from the place of friendship, with two friends needling each other and prodding each other along when the other is being silly…which happens a good bit in this serial. Bryant gets several good scenes full of dialogue; using her botany background to best Warren in a game of “words that begin with the prefix ‘Peri-‘ for one, and in another, going back and forth with the Doctor over the many meanings and uses of the word “so.” It’s a nice chance for Peri to not only shine with “her” Doctor from television, but her “Americanisms” come in handy in the climax. The supporting cast prove to be up to the wordy script as well. Pascoe’s script gives each of them their moments and character qualities. Book (Moray Treadwell), the holographic assistant responsible for composing and organizing the Lexicon slowly goes from flat and artificial to sarcastic but poignant as he handles and absorbs more and more words into his vocabulary, and Treadwell does very well in not simply making Book the most dreaded of secondary characters, the “deadpan snarker.” Chris Eley’s Warren is also a wordsmith, but more along the lines of “language shouldn’t have boundaries,” and he is just charming enough to gain Peri’s interest and just insane enough for her to realize it after a time. Olive Hume plays the flustered and overwhelmed Cawdrey at just the right note not to become annoying. And even though she dies early in the serial, Marie Collett’s Osefa still plays a vital role, and her role in the serial is a unique case of alien biology done right. For once, a Nicholas Briggs audio doesn’t assault our ears, either. There’s very little overt music as the score is quiet and melodic, but plenty of voice modulation with Book’s dialogue and a good bit of background noise that sets the sound; the students on campus, the clank of glasses in the bar, the constant mutterings of “…ish” by the infected convention goers or the zoom of motorbikes zipping past. After surviving The Apocalypse Element, it’s nice to have a play where the loudest bit is the yelling of Colin Baker. It really should have all come together into a great, top-tier story for Big Finish. But while the script is full of grand words and the actors deliver the dialogue well, what doesn’t quite come across is the plot itself. The play’s attempt to be too clever by half fails because it spends too much time trying to convince the listener just HOW clever it is. It’s easy to grab the big picture. The Onmiverbum infects people, controls their language, has a grand scheme that will ripple across the cosmos…but the script doesn’t give the viewers a true chance to get lost in the weeds, so to speak. …ish demands the listener’s full attention, and even them, there’s a lot that the listener might not pick up. I’ve listened to …ish twice and still had to look a few things up on the Internet to make sure I wasn’t missing anything, and it turns out, I was. It’s not that the plot is incredibly complex; there was a few twists and turns that come as a surprise…but there’s no URGENCY to the play. There’s a lot of yelling and grandstanding, but the true threat of the consequences of the antagonist’s scheme just don’t come off as much of a “world ender” as it should. Pascoe does a great job talking about language and how it works in society, and how it’s funny that the short a word is, the more meanings it can have and the most useful it can be, but the script falters by failing to convey just how important everything is, and the climax is loud and suspenseful…and actually quite clever by calling back to the first episode conversation between Six and Peri…but by the time the listener gets there, there’s a chance they don’t have the emotional investment to do anything but sit back and listen to the words. Oh, and even thought it’s my primary language…there’s something just a bit off as English being THE language of the universe. Sure, since Doctor Who is an English program(me), it’s going to be spoken, but the Doctor going on and on about how magic and special the English language is and how it’s known across the known universe…eh. Maybe I’m getting a bit multi-culturalisticish in my old age. Next up – God has sent help from on high to save the sinners of Ibiza. He has sent His angels to save their souls. Sylvester McCoy is the Doctor in The Rapture. This entry was posted in Big Finish Review and tagged Big Finish, Colin Baker, Doctor Who, Peri Brown, Sixth Doctor, TARDIS. Bookmark the permalink.